With data volume growing, finding adapted storage solutions to storage costs and performance objectives is a real challenge for IT department in large companies. Information Lifecycle management is about managing the data all along its useful life while offering the best performance and storage cost. 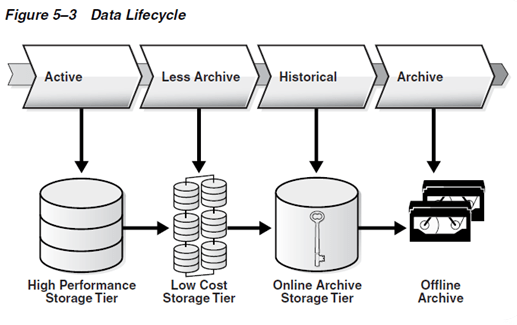 The concept is simple, data is spread into multiple storage tiers, each one with specific properties. According to this, you can keep active data on fast storage devices and inactive or less active data compressed or into cheap storage devices or offline storage (tape for example). As you can see in previous diagram, storage tiers are classed by usage, these data classes are definied in the database using partitions. The only thing missing here is the way to manage where and when to move the data. Oracle 12c offers a new tool to achieve this objective. Automatic data optimization is an automated way to compress and move data across different storage tiers. To decide which data needs to be moved or compressed, Oracle 12c uses policy management. These policies could be defined at row, segment or tablespace level. The policy defines where to move the data and which level of compression should by applied, but we need to know when to do it. This is why ADO can use a new type of statistics called HEAT MAP. Heat Map is a monitoring tool, it gets statistics about access and mofifications made to segments or rows. thanks to these statistics, ADO is able to know when data can be compressed or moved. Here is an example of policy that can be applied to a segment. This policy, automatically compress partitions using Advanced Row Compression after there have been no modifications for 30 days. The storage will be reduced for older data and queries performance for accessing a large amount of rows in the partition containing the old data will be improved. For data movement to a different tier, Oracle default criteria is the tablespace usage percentage, if you want to move data based on other criteria, you can use a policy based on a PL/SQL function. If the function return true then the data is moved, if it returns false, nothing is done. By default Oracle will automatically try to move the data to the new tier when the tablespace will start to become full. They can use different types of compression depending on storage tier properties and the objectives. COMPRESS ADVANCED standard compression for indexes and LOW for LOB segments. COMPRESS FOR QUERY LOW/QUERY HIGH standard compression for indexes and MEDIUM for LOB segments. Information Lifecycle Management is for sure a good solution for companies with large amount of data. With those tools you can achieve both performance improvement and storage cost reduction with practically no human action once all the policies are created and every tier is correctly set up. This feature is part of Enterprise Edition and requires the Advanced Compression option.